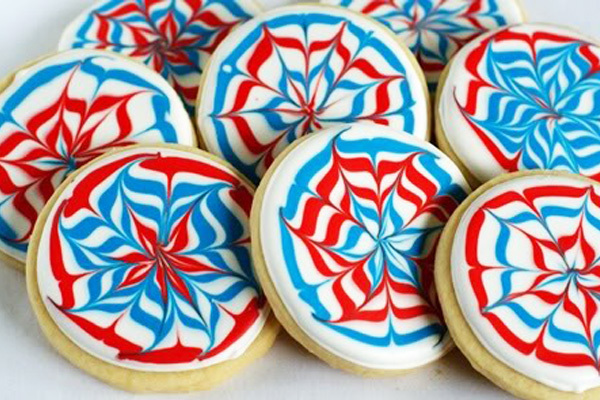 Mom Glory of the delicious website Glorious Treats shares these gorgeous Fourth of July star cookies — and we're sure that all of your pint-sized party guests will feel pretty darn patriotic while snacking on these sweet, red, white and blue sweets. To get started, check out her full post for her must-have sugar cookie recipe and tips on perfecting your royal icing colors. She used two cookie cutters — a scalloped circle and a mini star — to create the fun variety shown. Mom Michelle features not one, not two but three fantastic crafty food ideas for kids on She Knows' ChefMom, but it was these patriot parfaits that had us at first glance. 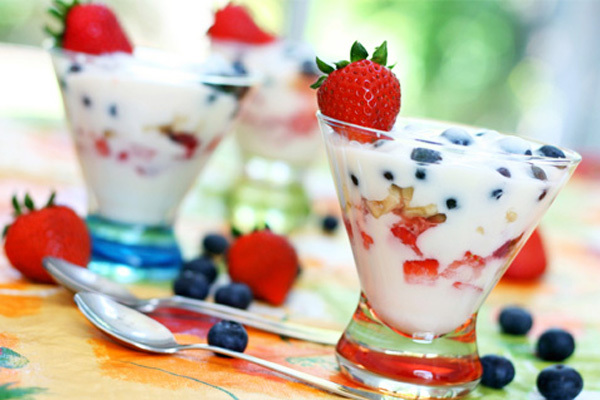 Featuring plenty of healthy red, white and blue options, this celebratory treats includes blueberries, raspberries and vanilla or honey Greek yogurt, with an added crunch of crushed graham crackers. 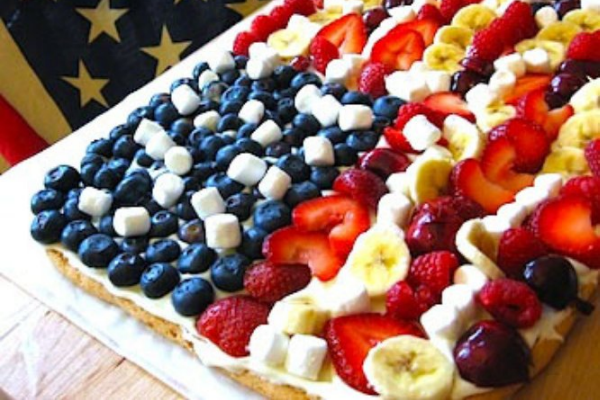 Whether you're serving it up in honor of this year's Independence Day celebration or as a simple summer dessert, your young food critics are sure to give this treat two thumbs up. Following Martha's lead, fantastic foodie Bridget of Bake at 350 shows us just how easy it is to make gorgeous fireworks cookies. To get started, you'll want to have a sugar cookie recipe on hand, along with a circle cookie cutter, royal icing and toothpicks. Check out the full post for a complete tutorial. 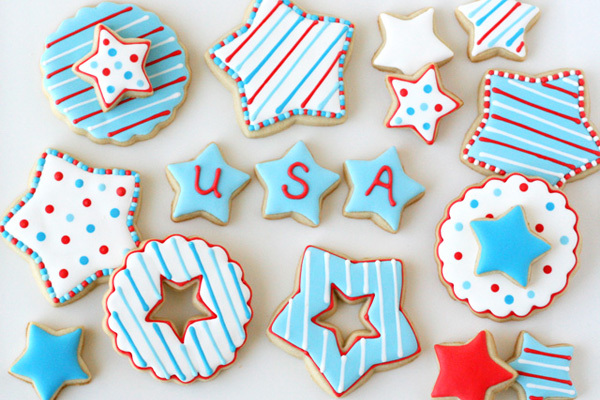 It's amazing to see how cookies go patriotic thanks to a toothpick! 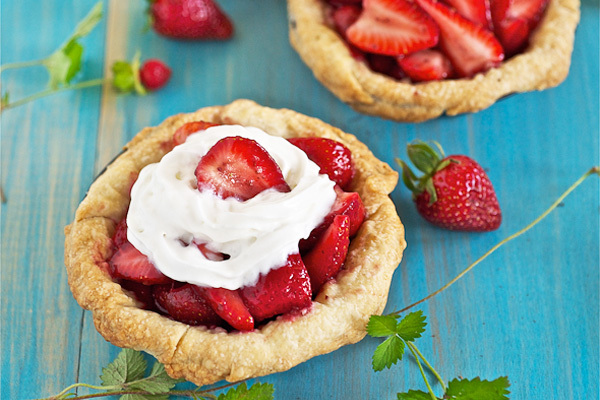 We cannot get enough of the fresh strawberry mini pies featured on Lemons and Anchovies. 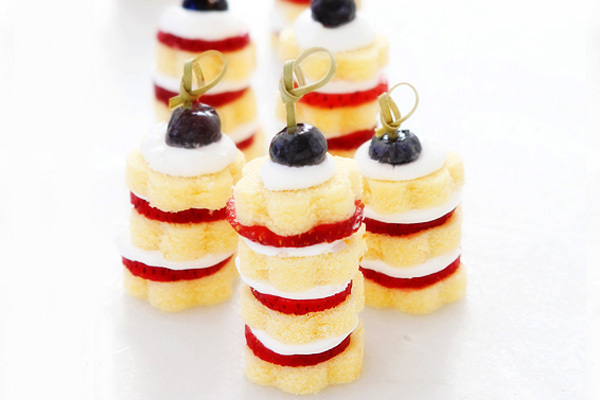 We think such tiny party treats would make for an absolutely stunning dessert on this year's Fourth of July picnic table with just about any berry filling. You can never go wrong with pie! Looking to take this year's fireworks to the next level? 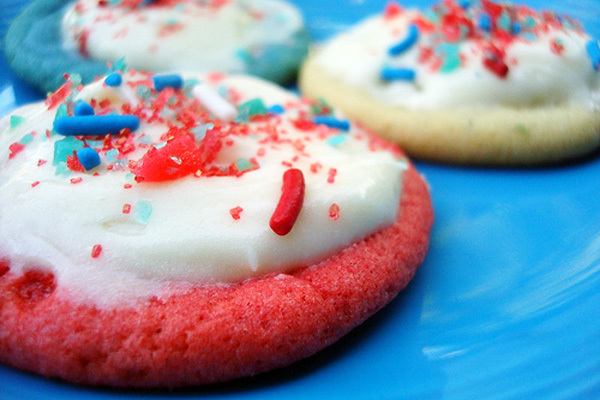 Don't miss out on CakeSpy's genius idea for explosively delicious Fourth of July cookies! By incorporating Pop Rocks into her favorite sugar cookies, Jessie creates fun sweets chock-full of snap, crackle and pop. Bakers Royale shares this go-to Fourth of July recipe for making mini strawberry shortcake stacks. Bonus: They're incredibly easy to make! To get started, take some Sara Lee pound cake and stamp out mini pieces with a daisy-shaped cookie cutter. Once you've cut out your cakes, layer them with strawberry slices and Cool Whip before topping your minis with a blueberry. Ta-da! What would Fourth of July be without a little bit of chocolate? Mama Deb of Smitten Kitchen offers up her recipe for these incredible root beer float cupcakes — ice cream included! 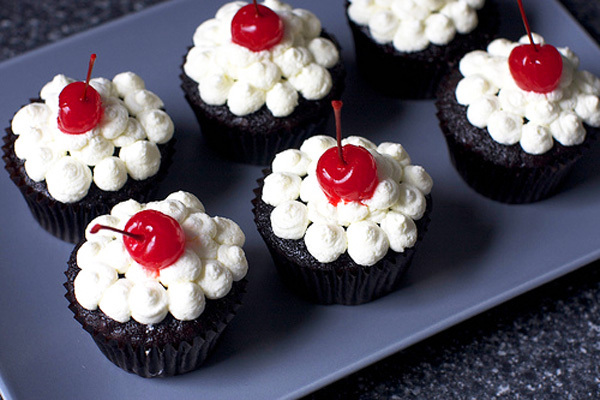 Also a great treat to be enjoyed all summer, these cupcakes include all the classic root beer float fixins including vanilla ice cream, root beer and a maraschino cherry. Remember the classic Jello Jigglers? These beautiful stained glass stars take us right back to the easy days of childhood when Jello Jigglers were the fun exception to playing with your food. They may not be the most highfalutin dessert on the table, but they're pretty darn easy to make thanks to Brown Eyed Baker. Ever made fruit pizza before? Plum Pudding includes this great spin-off for a Fourth of July cookie flag cake. There are just enough sweets to get the party started but enough fruit to keep it all in good measure! This example used kiwi, strawberries, blueberries and bananas though cherries or raspberries would also make for great red additions. Forget the store-bought candy bars and dare to make your own! 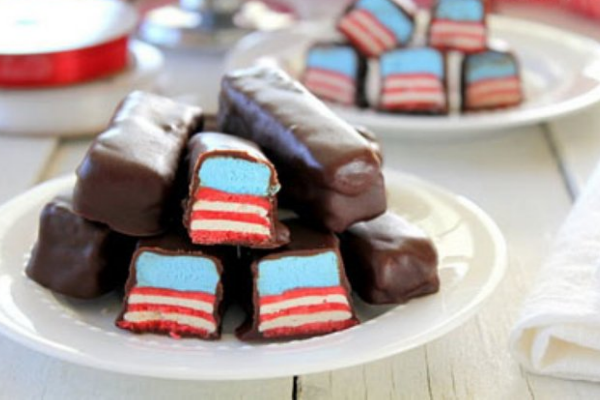 We are absolutely in love with these red, white and blue raspberry bars from Cherry Tea Cakes. Made completely from scratch, these cool chocolate treats are sure to be an absolute hit (and celebrated surprise) at this year's Fourth of July gathering. Need to chill out after a long day of family fun? 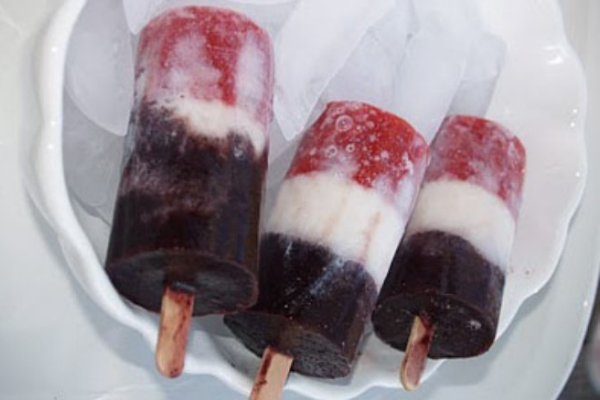 Consider making some delicious Independence Day popsicles like these from The Magic Onions. Simply blend up some strawberries, add a layer of condensed milk, top off with pureed fresh blueberries and you've got yourself some healthy but tasty ppops. 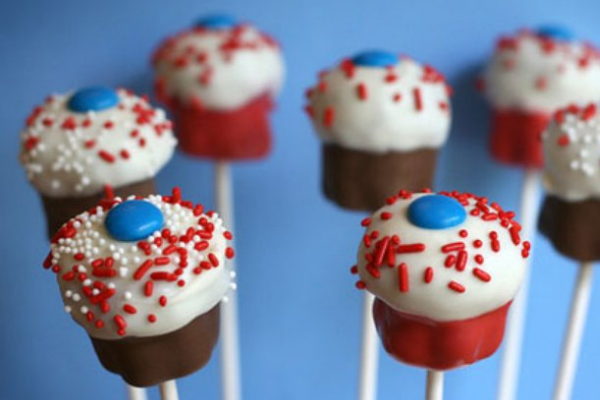 Nothing beats a patriotic cupcake pop. These bite-size morsels are all the rage and it's easy to see why. For the tiny toppings, Bakerella used blue M&Ms, red sprinkles and white nonpareils. While these patriotic bite-size "cuppies" (as everyone in our home calls them) may seem difficult, Bakerella offers an easy tutorial to make baking a breeze. This has got to be one of the biggest Rice Krispie treats we've ever seen! 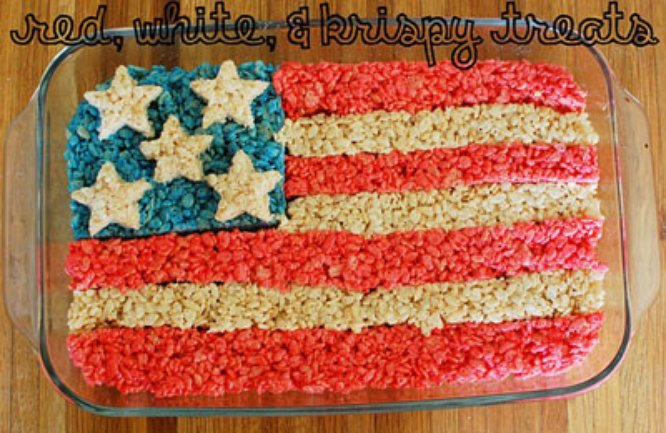 Random Thoughts of a Supermom explains how to whip up this cool edible flag with three half batches of classic Rice Krispie treats and a little bit of food coloring. 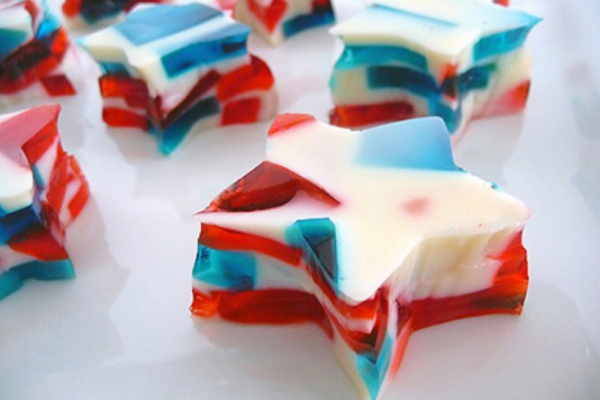 And for the flag's stars: Just use a cookie cutter. Overall, this is one dessert that will be easy to stow for a trip to see fireworks. Editor’s note: This article was originally published in June 2013, and updated in June 2017.